The Agilent 34411A sets a new benchmark for digital multimeter performance with up to 50,000 readings per second at 4 1/2 digits, 1 million readings of volatile memory and triggering capabilities. The 34411A has all the features of the 34410A, plus additional performance that makes it even more powerful. You now have the ability to capture low-frequency waveforms, characterize device performance and transfer results for analysis on your computer.The 34411A is a 6 1/2 digit, dual display benchtop for use in both R&D and manufacturing environments. 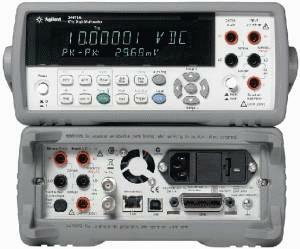 The Agilent 34410A and 34411A 61/2 Digit DMMs represent the latest generation of multimeters from Agilent Technologies. Building on the phenomenal success of the industry-standard Agilent 34401A, these new meters offer improved accuracy, expanded measurement capability, dramatically improved measurement speed and throughput, and modern computer interfaces including LAN and USB. The dual display offers both dual measurement capabilities and ease of use when setting up and configuring the DMM. Improvements have been made in every facet of the 34401A to make the best even better, whether you use it on the bench or in a system.